How do students spend there day? It’s a good question and there are lots of suppositions and some data that describe it but a recent study by researchers in Lyon, France, makes these interactions tangible. By putting RFID tags on students in elementary school, across 1st through 5th grades, how students physically interact becomes trackable. It makes movement visible. Their video about this is informative, generating a newer, clearer understanding of social interactions across grades in a single school day. It’s clear from the data that 5th graders are ‘special’. In this school I believe 5th graders are the highest grade, with students moving on from their to 6th grade at another school. The interaction patterns suggest they are rather isolated from the 1st through 4th grade students, or as the article notes, too cool for the rest. This comes from research published in PLoS,by a string of scientists: Juliette Stehlé, Nicolas Voirin, Alain Barrat1, Ciro Cattuto, Lorenzo Isella, Jean-François Pinton, Marco Quaggiotto, Wouter Van den Broeck, Corinne Régis, Bruno Lina6, and Philippe Vanhems, in an article entitled, “High-Resolution Measurements of Face-to-Face Contact Patterns in a Primary School.” This work was done to look at the interaction patterns from the perspective of potential infectious disease transmission – the interactions representing potential opportunities for disease transmission for the purposes of modelling epidemiological control strategies. Yet you can imagine a wide range of potential research topics with such detailed knowledge of interaction patterns of groups over time. 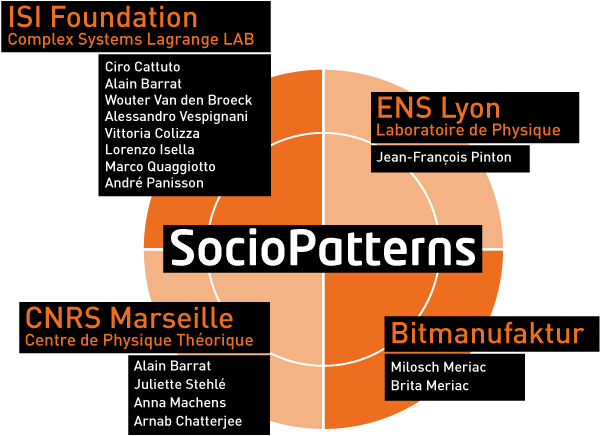 The collection of research groups and people involved in the SocioPatterns Collaborative. This research platform opens new vistas for looking not only at epidemiological data for epidemics and pandemics, but also utilisation of space in offices, classrooms and laboratories. Thanks to @aneesha for bringing this to my attention.